The New York City Community Garden Coalition is dedicated to the "preservation, creation, and empowerment of community gardens through education, advocacy, and grassroots organizing." With its long and storied life, it is the only organization in New York City that is run by and for community gardeners. The NYCCGC was founded in 1996. The gardeners are interested in "not only in improving their local communities, but in addressing the larger issues of making our city and world a greener, more livable, and more sustainable one for all." The NYCCGC is an advocate for community green spaces and promotes community gardens as a way to beautify the neighborhood and to bring attention to neglected areas, especially in low-income neighborhoods. The New York State Governor's Office of Storm Recovery recently awarded the NYCCGC with the Community Development Block Grant - Disaster Recovery. 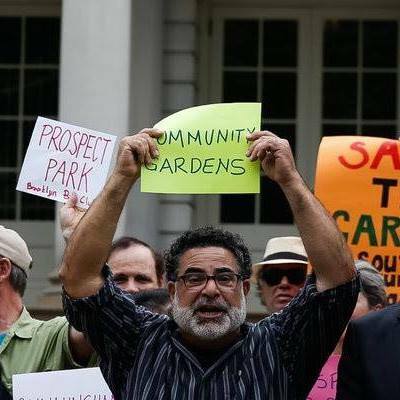 The project formed, Gardens Rising, is supporting a feasibility study to find the best practices of storm water capture, based in the Lower East Side community gardens. The goal of the study is to develop green infrastructure and master plan through input from the local community and experts in sustainable engineering. In addition, the study is attempting to help increase the permeability and storm water capture within forty-seven neighborhoods located in Lower Manhattan. To learn more about the New York City Community Garden Coalition, please visit their website. The New York City Community Garden Coalition has been a part of the Neighborhood Preservation Center's history since 2000 and today still frequently use our meeting room space and have a virtual office. For the full list of groups that have used our meeting rooms, please visit our website.